Where is the Capital of Washington? 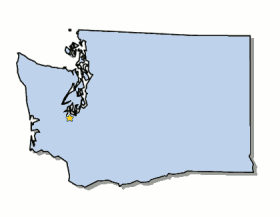 The Map of Washington (WA) shows the location of the state capital in the "Evergreen State". Washington has 39 counties, and the capital of the State is Olympia. On a map, the capital city is always indicated by a star. Interesting fun facts about Olympia including its history, location, county, current population, size of the city and the nickname of Olympia, Washington. The Map of Washington and map provides an outline of the state, which covers 71,303 square miles. The size of the state's capital city, Olympia, is 18.5 square miles. Test your recognition skills of the map of the state, and knowledge of its capital, with our State Maps Quiz Game. The location of Olympia is at the south end of Puget Sound on Budd Inlet, at the mouth of the Deschutes River. The city is located in Thurston county, Washington. Each of the 50 states have their own capital city. The city of Olympia is the capital of the state. The capital does not have to be the largest city in the state, but is usually centrally located either geographically or by population. 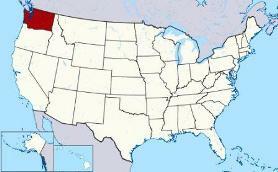 The State of Washington is located in the Pacific North west region of the United States. Fact 3: The population of the capital city is 47,698. Nickname "Oly" and "O Town"
Fact 5 on History: Native Indian tribes were the early inhabitants of the area, including the Chinook, Columbia, Makah, Nez Perce, Ozette, Wallawalla, Wynoochee and Yakima. Fact 7 on History: In 1846, Levi Smith and Edmund Sylvester jointly claimed the land that is now downtown Olympia. Fact 8 on History: In 1851, the U.S. Congress established the Customs District of Puget Sound for Washington Territory and the city of Olympia became the home of the customs house. Fact 10 on History: Isaac N. Ebey (1818 – 1857) a settler who worked for the U.S. Customs service and is credited with naming the city in honor of the Olympic Peninsula mountains to the west of Puget Sound. Fact 11 on History: In 1949 an earthquake caused major damage to many historic buildings and they were demolished. The number of people, or the population of the capital city of Olympia, obviously changes constantly but the government statistics for the 2012 population of Olympia was 47,698, which provides a good indication of the number of inhabitants of the city. We hope that the interesting facts and information about Olympia, Washington will help kids and school children with their homework. Learn more by playing the States and Capitals Game. Olympia Nickname "Oly" and "O Town"